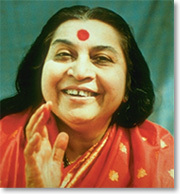 I remember going to my first Sahaja Yoga class in September 1998. It was the beginning of September when I tried this class. The instructor was friendly and the room was full. The only thing that keep me away from these people that my head was full of voices, I couldn't keep eye contact, fear prevailed in me and everything in me was caotic. I remember the instructor showing and explaining to use about chakras. Then a tape was put on where we watched and heard Shri Mataji speak. I really couldn't understand Shri Mataji because she spoke with a bit of an acent. However, when the video was turned off, I felt peace like I had never felt before and the voices were gone for a few seconds. Two boys were giving their testimonies on how Sahaja Yoga had improved their lifes and I was using eye contact and my fear was gone. I'm glad I came to Sahaja Yoga because my life has improved.